Viridor manage the household waste recycling centres in Somerset on behalf of Somerset Waste Partnership (SWP). These sites are ‘permitted’ to accept household hazardous waste since 1992. In the early 1990s, the majority of chemicals handed in by members of the public tended to be low in hazard but still needed to be handled in the correct way. Over the years, Viridor and SWP have seen the volumes of such waste increase, due to greater advertising of its potential threat and through the recycling initiatives developed by both organisations. As a result, the variety and volume of chemicals handed in for disposal at the sites have increased and have tended to become more hazardous in nature. Viridor and SWP jointly identified that staff and members of the public could be at risk from these chemicals if they were handled or stored in an inappropriate manner. They instigated a joint initiative to train staff in the identification and safe storage of these chemicals. Fully trained and qualified chemists, employed by Viridor, were asked to set up training courses to ensure the recycling staff were well versed in the safe handling and storage of household hazardous waste. This training involved each member of staff having to pass a written exam, with any failures needing to re-sit both the training and exam. SWP fully endorsed the training program and a number of their staff have also attended the course and undergone the exam process. Part of this training was to look at the way in which chemicals are stored on site. It was established that there was a logical and safe method in which chemicals were to be stored in the relevant containers. Through consultation with SWP, information signs were developed and placed within the hazardous waste containers, to remind site staff about the correct placement/stacking of this waste, ie corrosives in the bottom, and toxics on the top. 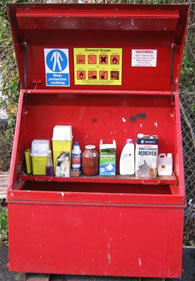 This course has been rolled out to other councils where Viridor chemists collect household hazardous waste. The training identified other improvements, including the safe storage of paint tins in UN approved drums. New courses are being developed to take the initial training to the next level – making the handling and storage of these wastes at household waste recycling centres an even safer operation.